William slippers from Tom Ford. 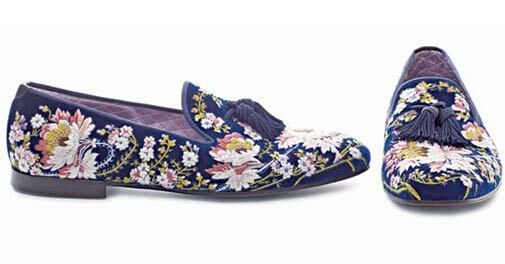 Florals are in this summer, and that goes for your feet too! These William slippers from Tom Ford are an embodiment of pure decadence. Made of exquisite hand-embroidered silk and adorned with a velvet tassel, this is style at its luxurious best. Carpets have long been the mark of great interiors, and there's nothing more elegant than a classic handspun carpet in your living room. Obsessions has brought out the Loribuft range of carpets, which redefines elegance and sophistication. A special hand-spun, all-knotted woollen carpet originating from Afghanistan, it is made of five different kinds of wool. These carpets are exclusively available at the Obsessions store. Lazing on the beach or by the poolside isn't about black trunks anymore. Calvin Klein Jeans has come up with a whole new range of trunks to help you in this matter. They are bright, colourful and totally trendy. Whether you are in the water or just chilling outside, grab a pair and get set to turn heads. Who said only girls can have fancy swimsuits? Paying homage to the king of football, the Heritage variant of the Pele Icons Pen Limited Edition features a solid gold or silver trim. The top of the cap is shaped to represent a football, atop a crown that reads 'All Hail The King'. The colours of the Brazilian flag form the surface of the cap in yellow, with green surrounding the crown. Get that kick in your writing! Do not compromise on style even when you're shuttling between places. This Corneliani leather holdall is a great piece to have when you are on the move. Spacious enough to pack all your essentials and dashing enough to up your style quotient, give this a shot on your next vacation.